The first half of the 20th century was a time of great change in the sporting rifle market. This period saw the transition from blackpowder to smokeless cartridges, and scoped bolt-action rifles stole the lion’s share of the market from lever guns. But there were still plenty of hunters who relied on lever guns with open sights. To meet the needs of lever lovers, Winchester introduced the Model 71 lever gun—essentially a modernized Winchester 1886—and, alongside that rifle, the .348 Win. cartridge. Based on a shortened and necked-down .50-110 blackpowder cartridge, the rimmed .348 Win. was capable of driving 200-grain projectiles from the 71’s 24-inch barrel at more than 2,500 fps for about 2,800 ft.-lbs. of energy—substantial punch for even the largest game at modest ranges. The Model 71 was slick and robustly built, although never a tack-driver. It was also expensive to make, and high costs kept it from being one that appealed to the masses. Additionally, the 71’s stout recoil was more than the average deer hunter cared to deal with. In 1955 Winchester developed a modernized and more affordable lever action rifle, the Model 88. Initially, the 88 was offered in the then-new .308 Win. cartridge, a round that soundly beat the ballistics of the .348. To appease those hunters who wanted more punch, Winchester offered a necked-up .35-caliber version of the .308, the .358 Win. It offered as good or better energies than the .348, and the .358 was housed in a modern lever-gun built to accommodate scopes. Not surprisingly, the company dropped the Model 71 just two years later. If the story ended there this would be less of a clash and more of a beat-down, but despite essentially being put out to pasture, the Winchester 71 and its cartridge live on—sort of. Though its parent company essentially washed its hands of the rifle and round, hunters weren’t so quick to ditch them, and it’s been said no true Winchester fan’s collection is complete without a 71. In terms of ballistics, the .358 Win. and the .348 Win. are kissing cousins despite their disparate case designs. 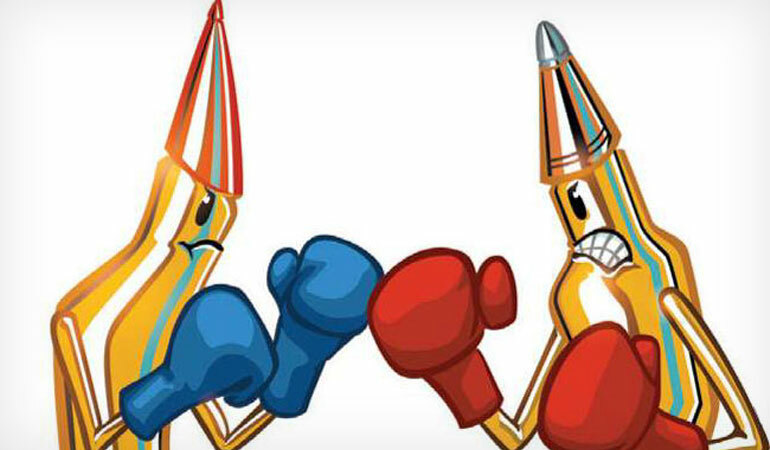 Both cartridges were most commonly loaded with 200-grain bullets at about 2,500 fps, and both rounds can achieve energies above 3,000 ft.-lbs. by handloading. One gut-punch for the .348 is that its tubular magazine requires flat-nosed bullets—with the exception of Hornady’s FTX projectiles. So the .358 is a flatter shooter than the .348 in most cases. Further, the choice to use a bullet that didn’t work in any other commercial cartridge for the .348 made, and still makes, finding bullets pretty tough. There aren’t an abundance of .358-inch spitzer hunting bullets compared to other popular calibers, but there are a lot more .358 bullet options than there are .348s. In terms of rifle availability, the .358 wins by a substantial margin. You can still purchase a Browning BLR chambered for the cartridge, and Winchester, Ruger and other companies have offered bolt guns chambered for the round. Or, if you’d like, you can simply rebarrel a .308 to a .358, and .308 brass is widely available and can be easily resized. Brass for the .348 is far harder to come by, and you won’t find much factory-loaded ammo. It may seem the .348 is on the ropes, but don’t discount this round yet. You can find original Winchesters and a few Browning 71 reproductions, and Uberti and Cimarron Firearms have also offered repros in .348. So a diligent search will turn up guns. You’ll want to handload if you’re serious about shooting this round, and while there aren’t many of them, there are some really good .348 hunting bullets available from Swift, Hornady, Barnes and others. Owning a .348 isn’t for everybody, but it’s a cool cartridge that packs substantial punch.